NVIDIA released their GeForce GTX 1070 and GTX 1080 not long ago, featuring the company's new Pascal architecture, a brand-new 16 nanometer production process, and GDDR5X memory. In our launch-day review, we were truly impressed by how well NVIDIA claimed the performance throne with the 1080, but also the GTX 1070 managed to impress with its high-end performance at an attractive sub-$400 price-point. 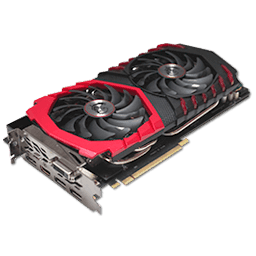 The reference-design card, however, is sold at a $70 premium over the GTX 1070 Founders Edition sitting at $449. The GeForce GTX 1070 uses the same Pascal GP104 graphics processor as the GTX 1080, with just 1920 enabled shaders instead of 2560, which also affects the number of texture units that are down to 120 from 160. With 64, the number of ROPs is the same, and so is the memory capacity at 8 GB. However, today's review subject, like all GTX 1070 variants, uses GDDR5 memory, unlike the GTX 1080 that comes with GDDR5X. GDDR5X offers twice the bandwidth at the same operating frequency, so NVIDIA is running the GeForce GTX 1070's memory at a frequency of 2 GHz in order to make up for that. 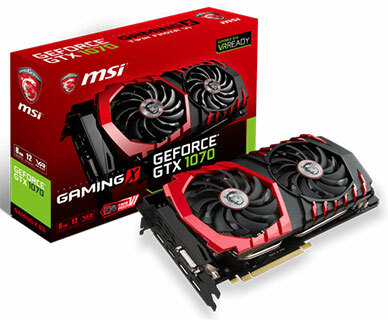 In this review, we are taking a close look at the MSI GeForce GTX 1070 Gaming X, which uses the company's new TwinFrozr VI cooling solution, which is mated with a custom-designed PCB by the company. The two enable a significant factory overclock for more performance and, hopefully, less noise than the GTX 1070 Founders Edition. We also hope that the thermal throttling of the Founders Edition is a thing of the past, which would yield additional performance. With a retail price of $459, the MSI GeForce GTX 1080 Gaming X in this review is more expensive than the Founders Edition.